Cold weather is upon us in my neck of the woods and I've lost the immunity to cold that I brought to Tennessee from northeast Ohio. How did this happen? My idiot savant ability to ignore low temperatures comforted me. In past years, I've complained of the lack of adequate seasons in dear old Tennessee. Basically, the years starts out just wet and yucky, then moves on to Pre-Spring (anything can happen), Spring (anything can happen), Pre-Summer (hot), Summer (hot), Early Fall (still pretty warm and just about perfect), Fall (anything can happen...but a lot of rain) and "Winterish." During the season of "Winterish", there is a chill in the air and the arrival of the first frost is hotly debated by way too many people. There's usually some snow somewhere along the way, but no snow drifts or potential snowmen can be projected for any given year. Prior to this year, I've managed to go straight through to December without putting on a coat or abandoning my oh-so-comfortable high dollar sandals. Oh, it has been chilly and cold in past years, but not enough to bother me. Long sleeves usually do the trick. While walking through the stores, I'd be comfortable, yet see others in big winter coats and scarves complaining about the cold. I confess, I felt superior in an insane, meteorological way. Like I actually knew Al Roker and he controlled weather for me; we all know that feeling. The first cold snap of the season is here and apparently, I am becoming an actual native after living here for twenty-four years. As the temperature dipped below freezing, I felt every stinkin' drop of the thermometer. Brrrr! Totally out of character for moi. I've actually changed plans because the cold felt so miserable. I. put. on. a. coat. today. All this must be leading up to being the old spouse, griping about the cold and arguing about the thermometer settings. Complaining about blanket ownership and forcing my Popsicle toes on my unsuspecting (and hot blooded human bed warmer) husband - I can see the future. I'll probably get a heavy babushka and shawl and start talking with an eastern European accent to complete the picture. I'm cold, ya'll. For the first time in my life. After the past 8 California winters of wind blowing in a lot of nothing, I have also lost my tolerance for cold and wet. We are having rain now, finally, and my San Francisco boys are shivering on their work commutes, so it looks like winter for a few more days at least. And that's good for us, but I bundle up every morning against jittery jumps I never felt in 35 years as a professional gardener. I have gotten soft in retirement. Daughter calls from Chicago "It's 14 degrees!" I say: Ah, you're young and tough --I'll visit in the springtime. She loves me anyway. George, I'm glad I'm not alone. I thought I had lost that therma-weakness for good. Nope. As you know I moved to Florida from Pennsylvania. I remember one winter night in the 1980s when the temperature dropped to a record breaking 19 degrees in Tampa. I remember seeing snow flurries here in Central Florida two or three times in the last 30 years. The last few winters have been, or at least have seemed, milder than usual. Maybe I'm regaining my immunity to cold. I used to wear a heavy winter coat most days in January but lately I get by with a jacket. BREAKING NEWS: There is a possibility that Mrs. Shady and I will be moving north to the Carolinas a few months from now in which case I will once again experience something resembling four distinct seasons. How can Shady leave me alone in Florida, Cherdo? It's not right. Shady can't be tamed. He's a rebel...a loner...a giant amongst men...we can't compete with that. And he has good legs - especially in tights. Hubzam has many skills, but that IS one of the most appreciated. My bedroom walls need to be turned into heating panels. I live in Nashville, so I laughed out loud at your description of our reaction to snow. The funny thing is, it's been SO long since we've been snowed in for more than a day, the reaction is just ridiculous. It usually melts before noon...but my husband calls it the "French Toast effect." He said everyone rushes to the store to buy bread, milk, and eggs when snow is forecast, so he figures snow makes people crave French Toast. I don't understand what people do for bread, milk, and eggs when we DON'T have a snow report? Don't they have this stuff in their houses already? Do people normally go to the store every day and this one morning of being stranded at home just completely throws them off? I know, right? I'm not lying, either - here is a respectable author with a FOUR BOOK DEAL AT SIMON & SCHUSTER, peeps! She's knows how it rolls in the T-N.
BING BING BING! We have a winner in the "name that secretly referenced song on the flipside" quiz. I didn't think anyone would remember that. Point: STM. I used to live in Northeast Ohio - Cleveland. There was always a lot of lake effect snow there. I'm getting spoiled living in Georgia! I lived outside of Youngstown. Lake effect is hard to explain to anyone who hasn't experienced it. The South will spoil you in all the right ways. Pretty much the entire family - cats included - use me for body warmth. I get loads of cuddle time this time of year. It's a gift from God directly to males (since they have to put up with PMS). I wish I had a bed warmer - I could use one. Maine is very cold and I'm certain it has gotten colder with each successive year. Winter and I are not good friends. You can get an electric mattress pad. Turn it on about an hour before you plan on going to bed. I LOVED Maine! Mrs. Penwasser? Not so much. To show her how good she had it in Vacationland, I took her to Iceland for a year. Maine is one of my favorite places to go, but I've never been there in winter. I want to know how you stand the mosquitoes in summer! Near Bar Harbor, we stopped and got out of the car and literally ran back ten minutes later because of the cloud of mosquitoes that surrounded us. What's up with that, Hatchling? When The Hurricane went to school at Cambridge, she told me very funny stories about the English reaction to snow. She said it snowed a little bit one morning. The snow melted by noon. Everything was closed, even the post office. The English also use umbrellas when they're out in the snow. Wow, no wonder the Europeans like East TN. Umbrellas seem synonymous with England; apparently, for good reason! Hm. Sounds like you transplanted to New England. Snow day coming, people buy bread and milk. (I infer from this that New Englanders eat French Toast during snowstorms. One way to use up all that extra maple syrup? 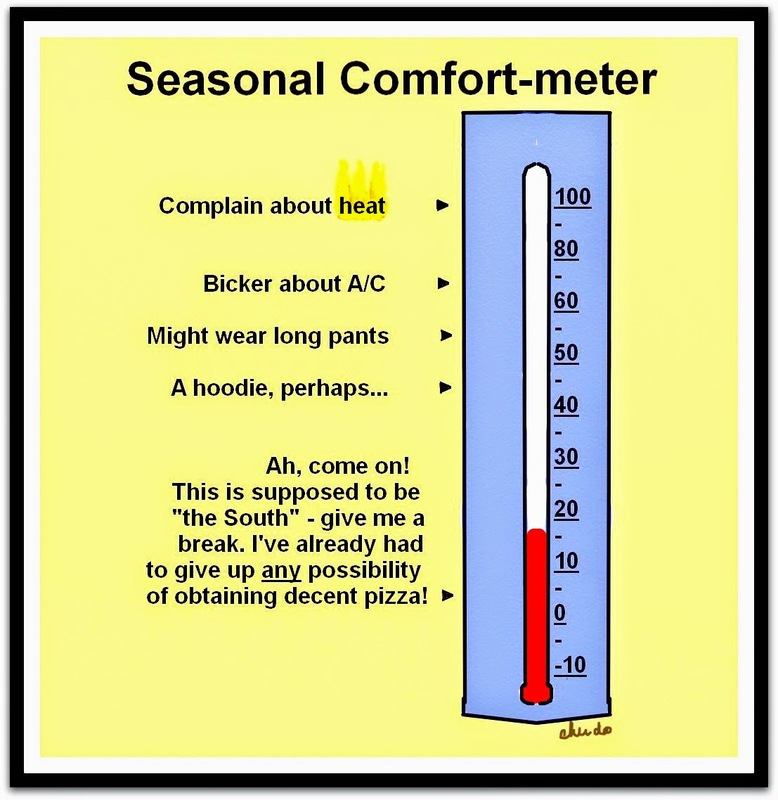 Hmmm…) My family is related to yours: that thermometer is spot on. Thanks for the truth and the chuckle! At your service - I love to induce a chuckle. My friend has the constant cracked window even when she is shivering and putting on more sweaters. Missed seeing you around, Suze! Hope everything is going great! With sandals, ha ha ha. I've found my second home! Start scouting out the rentals for me, Lexa! I remember, years ago, when I was living in Norfolk, Virginia and a friend from Alabama commented that he "loved the change of seasons" in Virginia. I said, incredulous, "Change of seasons? Norfolk has only three: green, brown, dead." Yes, I was all full of my New England self. Now? In my mid-50's? As soon as I can move south to where it's just "green, brown, dead," I'm there. Rather than thanking my lucky stars that I don't live in Buffalo, I dread the fact that that kind of crap will eventually head this way. My mantra: green, brown, dead. We need to make t-shirts with G B D on it. I'm liking that saying. Hurry up and put a trademark on it, I'll do the logo. My sis heads out to AZ. I guess her mantra would be "beige, beige, unbearably hot beige".